With help of lead management you can determine targetedly who will be appealed with content at any time. You decide if you share content with an individual person, a target group or your whole address book. The more you know about your leads, the more possibilities for selection and communication you have. 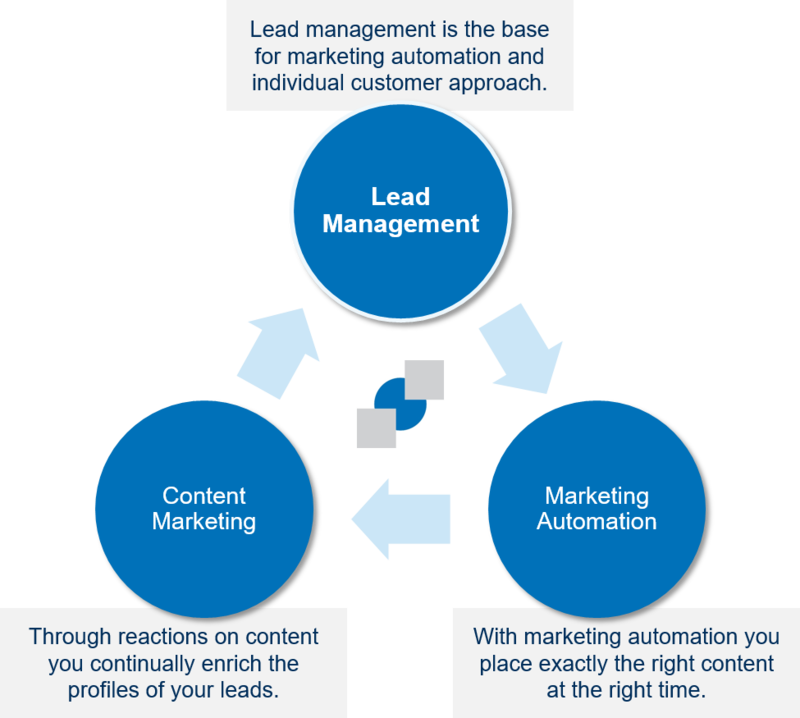 Thus, lead management is the base for any marketing automation. Why do you need lead management? Successful Marketing Automation and especially e-mail marketing subsists on data. You must know your customers, prospects and partners and process a variety of information about them to achieve them in the right moment with the right message. If you’d like to send targeted and personalized e-mail campaigns, perfect data management is essential. With support of AGNITAS, you converte Big Data to Smart Data. Completely automated processes, tools and interfaces ensures that your data are always up to date and are enriched currently with valuable information. To collect data is very easy, the challenge is the targeted use of them. With a smart creation of target groups, you can reach your customers on every touch point of the customer journey. Through targeted marketing campaigns you increase your customer engagement in the long run. Realtime and agile marketing campaigns enable you to react in realtime. Since your success is significant to us, you find the perfect interaction of lead management, marketing automation and content marketing here at AGNITAS. 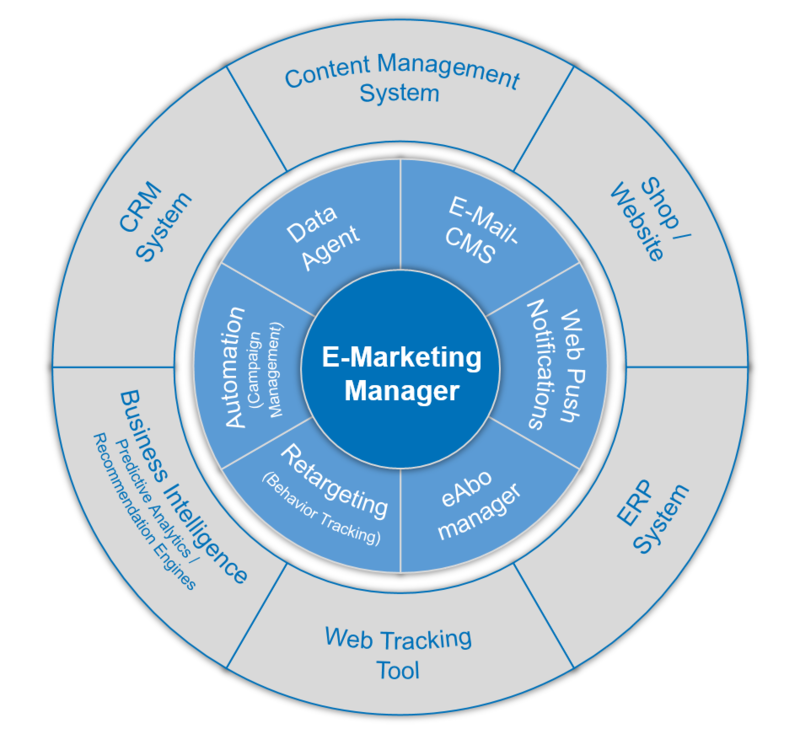 Our software E-Marketing Manager completely covers the areas lead management and marketing automation. We also know that technology alone is not enough.Therefore we support you not only with creating new newsletter templates etc. but also with creating relevant content – with our content modules. This range of services clearly differs us from our competitors. Recipient: The smallest unit is the recipient. At the recipient you store all individual characteristics of the lead. Therefor you can use arbitrarily many profile fields (formats: date, numeric, alphanumeric). Creating new profil fields is completely up to you, you are not dependent on support services. Per default are 50 profile fields included. Target groups: You can combine any characteristics of your recipients to a target group. Here also applies: You can absolutely independent and without much knowledge about data bases create your own target groups. Mailing lists: A mailing list represents the complete address book. Generally the mailing list includes the whole address list of a business unit. You can at any time autonomous create further mailing lists, e.g. for different countries, profit centers or subsidiaries. Reference tables: In reference tables you organize general information. Beside of personal data exists information like a product catalog, which will be stored in so-called reference tables (component of our Retargeting Package). You can define structure and extent of those tables on your own. In contrast to our competitors you are completely flexible with AGNITAS regarding quantity of data, profile characteristics and organization of your leads. The connection of different systems like CRM, CMS or shop system with the E-Marketing Manager enables a centralized data management for your recipients data. So it is possible to save important information about your customers and prospects directly in the EMM. Via Interfaces, DataAgents, Auto-Import and User-Selfservice-Forms you can simply generate and update your recipient data. Additionally enrich your recipient profiles with behavioral data. 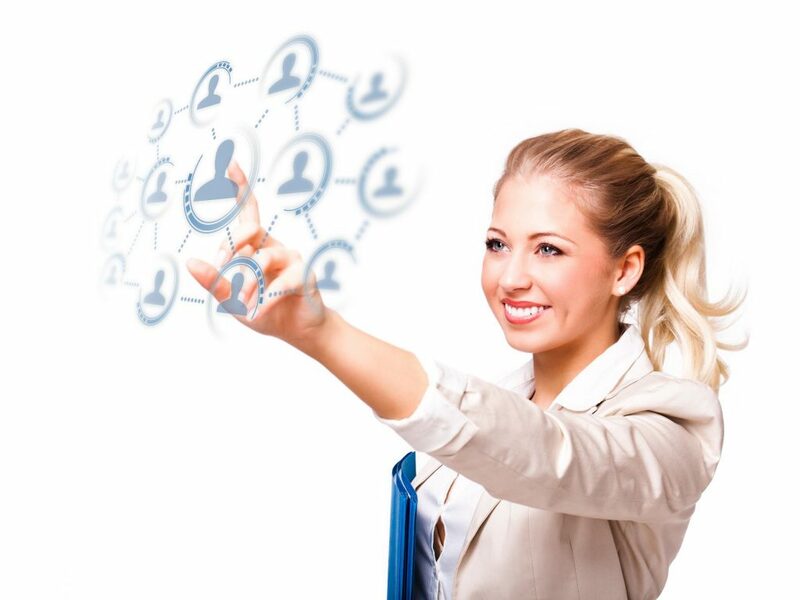 Through tracking of openings and link-clicks you can sharpen the profile of your leads. (Note: Please point out in your data protection statement that you track newsletter response.). Highest level is, when you automatically track the surf-behavior of your recipients on your website with our Retargeting Package. Thus you have all options for retargeting, like abandoned cart mailings etc. A simple way to get to know more about your recipients, is Content Marketing by e-mail. Just provide your recipients relevant content, the click behaviour gives you a lot of information about their interests which you can save on their profiles. We gladly support you with the realization of Content Marketing by e-mail. Last but not least: Decisive is not the mass of data, but the quality of the data. With comprehensive evaluations for data quality checks, you can keep an overview, you can correct mistakes and you can clear up your data. The data quality report of AGNITAS continually informs you about the state of your data. In our blog post “10 tips for successful data management” you additionally find practical tips to improve the data quality on your own. Feel free to ask if you are interested in an integration into your it-system. Obviously, we are also more than happy to help you with every other question concering lead management!